Classic Film and TV Café: Fighting Skeletons, Winged Harpies, and the Metallic Talos Highlight Ray Harryhausen's "Jason and the Argonauts"
Fighting Skeletons, Winged Harpies, and the Metallic Talos Highlight Ray Harryhausen's "Jason and the Argonauts"
In his delightful Film Fantasy Scrapbook, Ray Harryhausen wrote: "Of the 15 fantasy features I have been connected with, Jason and the Argonauts pleases me the most." 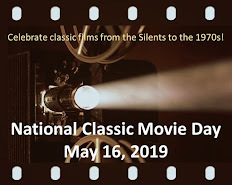 And as a long-time Harryhausen fan, I confess that it's my favorite among his incredibly imaginative works (with The Seventh Voyage of Sinbad a close second). Based on the tale of Jason and the Golden Fleece, the films opens with Pelias (Douglas Wilmer) about to launch an attack on Aristo, the king of Thessaly. On the eve of the battle, an oracle warns Pelias: "It is also foretold that although you will win the throne of Aristo, you will--when Zeus ordains--lose it to one of Aristo's children." That night, Pelias decides to take the lives of Aristo's children to prevent the prophecy. However, the baby Jason is taken to safety and Aristo's daughter Briseis seeks the protection of the goddess Hera. Despite the risk of incurring Hera's wrath, Pelias kills Briseis. A shadowy figure in the temple tells Pelias that a one-sandaled man will prove his undoing. Twenty years later, while searching the countryside for Jason, Pelias falls in a river and nearly drowns. He is rescued by a young man, who emerges from the water with only one sandal. Pelias realizes immediately that Jason (Todd Armstrong) has arrived to reclaim his father's throne. However, Jason has never seen Pelias and doesn't know that he has saved--and now befriended--the man that murdered his family. Fearing Hera's wrath, Pelias knows he cannot kill Jason outright, so he suggests that the young man rally the downtrodden people of Thessaly with an inspiring act of heroism: retrieving the Golden Fleece from the edge of world. Jason stages a competition to select the bravest, strongest (e.g., Hercules), and smartest men (e.g., Hylas) for his crew. Unfortunately, Pelias' son (Gene Raymond) joins the ranks, too, and his goal is to ensure Jason never returns. With five wishes from Hera to assist him, Jason sets sail aboard his ship the Argo in search of the Golden Fleece. One of the two Harpies. What I have just described is essentially a 45-minute build-up to an incredible hour of thrills and chills courtesy of Harryhausen's amazing stop-motion special effects. Jason and the Argonauts encounter the metallic god Talos, the pesky winged Harpies, Triton and the Clashing Rocks, the seven-headed hydra, and the "hydra's teeth", which sprout into an army of mean-looking skeleton warriors. Every fan has his or her favorite creature and, while the Harpies and the Hydra always amaze me, I've got to go with the skeleton warriors. Even with today's digital special effects, I cannot imagine the climactic skeleton fight looking any better. Jason and the Argonauts was filmed in a small coastal village south of Naples. 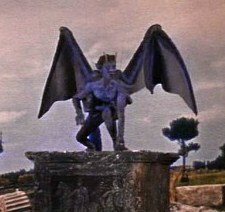 The production took two years to complete, with most of the time devoted to Harryhausen's special effects. In his Scrapbook, Harryhausen describes the skeleton sequence: "There were seven skeletons fighting three men, with each skeleton having seven appendages to move in each frame of film, this meant an unprecedented 35 animated movements had to be synchronized with three live actors' movements; so one can readily see why it took four and a half months to record the sequence for the screen." Harryhausen notes that one of the most difficult effects to achieve was the herky-jerky movement of the giant metallic Talos. The irony is that Harryhausen spent his career trying to make his creatures move in a smooth, lifelike manner. 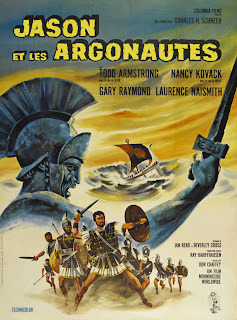 Aside from Harryhausen's impressive contributions, Jason and the Argonauts remains an entertaining adventure yarn. It takes a while to get going, but once it does, director Don Chaffey maintains a lively pace. Bernard Herrmann, who collaborated with Harryhausen on three other films, provides a rousing score. As for the cast, Todd Armstrong makes a solid hero, though he's not as charismatic as Kerwin Matthews from The Seventh Voyage of Sinbad. Niall MacGinnis (from Curse of the Demon) and Honor Blackman (Goldfinger) are fun as Zeus and Hera. 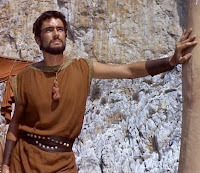 The best performance, though, comes from Nigel Green, who makes a brief but memorable appearance as a very different Hercules. In contrast to Steve Reeves' portrait, Green's Hercules is a middle-aged man well aware of his celebrity, whose greed and guilt limit his involvement in Jason's quest. Jason and the Argonauts is not "the greatest film ever made," as Tom Hanks said when awarding Ray Harryhausen a Special Oscar in 1992. But it may be the best fantasy action film and Harryhausen's marvelous creatures are a wonder to behold time and time again. In my opinion, it was the pinnacle of Harryhausen's incredible career. There were still good films to come, such as 1974's The Golden Voyage of Sinbad, but nothing worthy of comparison to Jason and the Argonauts. Rick, I have not seen many films boasting Ray Harryhausen's work, and I've only seen bits from this film. 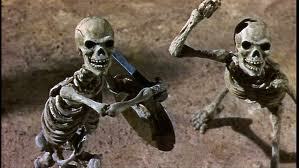 I do find it interesting and humorous that Sam Raimi's ARMY OF DARKNESS has the army of skeletons that look just like the battling skeletons in this movie (though Raimi's skeletons are additionally armed with humor in the style of THE THREE STOOGES). I've added this (along with the THE SEVENTH VOYAGE OF SINBAD) to my list of films (quite literally, to my Netflix queue). This was a delight to read and highly informative. Much thanks! Rick, if you remember, you beat me to it in choosing Jason for this month. I have loved that movie since I was a kid, and I still do. Harryhausen's creations are his best. The skeletons gave me nightmares as a kid, the harpies were funny and awful with their strident screeching. I always love the Clashing Rocks when Neptune rises from the sea to hold them back. Strangely, that was the one sequence in which Harryhausen did not create a figure -- it was a real guy. I do remember thinking when the ship passed under his armpit, wondering if the gods used deodorant! For me, the one that creeped me out the most was Talos, the giant man of bronze. When he turns his head to look at the men, with that creaking sound, his eyes are blank, and that scared me to death! Your information about Harryhausen finding him so challenging was really interesting. Harryhausen was a master, and had to have been the most patient of men! What an incredible talent. Thanks for your tribute to a fantastic film! Rick, both JoAnn and I love this film; it's our favorite Harryhausen movie. Thanks for your great post! I think Mysterious Island and The Seventh Voyage of Sinbad, both with great Bernard Hermann scores, are tied for second place, with Earth Versus the Flying Saucers a distant third. I think "Jason and the Argonauts" should be required viewing for every film student. Ray Harryhausen is the master of stop-motion filming. But "Jason" also proves a very important point: it doesn't matter how great the effects are if you don't have a good story to tell. It also shows how vital sound is to the special effect. Talos's movements are excellent and the metallic sounds are crucial to this character. The irony is that we never would have seen him in action if Hercules had obeyed Jason's instructions. The Harpies are frightening, especially to their blind victim, but it is the Skeletons that left me mesmerized. They were so evil looking and, of course, persistent. I truly became a fan of Harryhausen when I watched them come to life, as Herrmann's brilliant musical score announced them, and they unwaveringly plowed forth into battle. Talk about magic on the silver screen! Rick, your review was awesome! This is such an excellent fantasy film. Ray Harryhausen rocks! One of my all time favorites. Becky already pointed out the scene where Talos turns his head and looks down on Hercules and Pelias. Spine chilling! I think its one of the best creep moments in movie history. One of my all time favorite movies and I just saw it a couple of months ago with my husband. What is there not to like in this film? It is one exciting scene after another. The skeleton scene is so unique. How can you fight a skeleton who is already dead? Clever the way they are destroyed. Harryhausen movies are all good. Enjoyed your review and loved the photos you included. "Jason and the Argonauts" also has one of my favourite closing lines when Niall MacGinnis as Zeus says: "For the moment, let them enjoy a calm sea, a fresh breeze and each other. 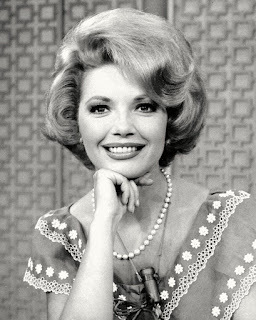 The girl is pretty and I am always sentimental. But for Jason, there are other adventures. I have not finished with Jason. Let us continue the game another day." Rick, I don't recall ever seeing this film. But the special effects you describe (along with the images you provide) really intrigues me. I think I will add this to my Netflix list. Hi Rick. I'd like to present you with the 7X7 Link Award for your great blog, Classic Film and TV Cafe! You'll need to reveal seven random things about yourself, seven of your blog posts, and pass on the award to seven of your favorite blogs. Just check out my blog for the details. Congratulations! And great post on Ray Harryhausen's Jason. It's always fun to watch.